The research team was led by Patrick Schlievert, professor and chair of microbiology in the UI Carver College of Medicine. The findings are published this week in the Journal of Infectious Disease. The new vaccine targets toxins that are made and secreted by staph bacteria. Earlier work by Schlievert’s team found these toxins are responsible for the serious, sometimes deadly, symptoms produced by staph infections, including high fever, low blood pressure, and toxic shock. The researchers believed a vaccine that blocked the action of these toxins might prevent the serious illness caused by the bacteria. Using an animal model that closely resembles human staph infection, the researchers showed that vaccination against three staph toxins provided almost complete protection against staph infections. The vaccinated animals were protected from disease even when they were infected with very high doses of bacteria. Furthermore, not only did the vaccine protect the animals from dying, but seven days after vaccination there were no disease-causing bacteria remaining in the animals’ lungs. The team also found that passive immunization—using serum from vaccinated animals to immunize other animals—was successful. This finding suggests that antibodies induced by the vaccination are the protective factor. According to the Centers for Disease Control and Prevention, Staphylococcus aureus bacteria are the most significant cause of serious infections and infection-related deaths in the Unites States. These bacteria cause many kinds of infections, from boils and other skin infections to life-threatening pneumonias and sepsis. Approximately 70,000 Americans develop staphylococcal pneumonia every year, including cases caused by highly antibiotic resistant MRSA strains. Many of these patients die from their illness, and many require extensive convalescence. Previous attempts to develop vaccines have targeted proteins on the surface of staph bacteria, but these vaccines have not been successful. In the current study, Schlievert and his colleagues found that vaccination against bacterial cell-surface proteins actually increased the severity of the infection. 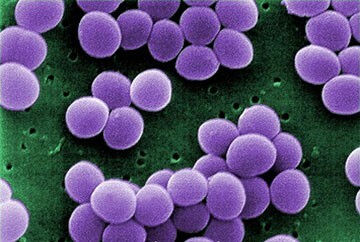 In contrast, the new vaccine, which targets staph toxins, provided almost complete protection against staph infections. In addition to Schlievert, the study team included UI researchers Adam Spaulding, Wilmara Salgado-Pabon, Joseph Merriman, and Christopher Stach, as well as Yinduo Ji, Aaron Gillman, and Marnie Peterson from the University of Minnesota.